Over 400 art & music lovers packed the house and raised the roof on the fifth floor of the Bemis Center for Slide Jam, an event that brings out the fast and furious in everybody. Three screens kept heads turning in the vast, high-ceiling space as Bill Hoover & Co. got the crowd revved up with a jammin’ musical set. Local and regional artists brought the thrills and chills as they stepped up to present their latest work in only five fleeting minutes. Whether it was Melanie Judkins presenting contemporary tattoo art accompanied to a remix of Beethoven’s Baroque 5th, or Scott Blake filling the room to the rafters with bubbles and balloons, each artist generated major buzz with work that put the J-A-M in Slide Jam. 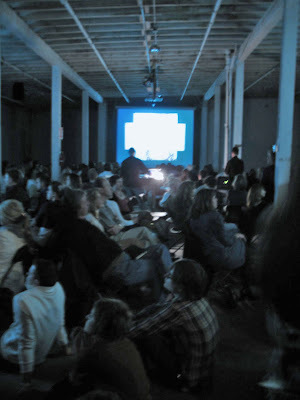 Three projectors running meant there was no bad seat in the house. 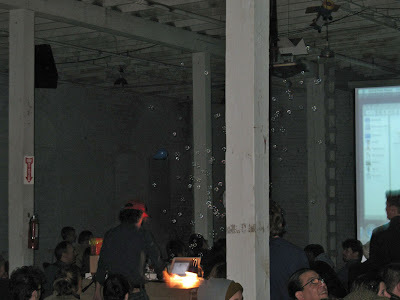 Scott Blake incorporates bubbles, piñata and party favors into his presentation.